No matter how small your transitional style bathroom, this 37 inch Hazelton bath vanity will provide character to your bathroom. You will be surprised how much storage this single vanity offers with its four drawers and removable storage cube inserts included in each drawer. A shelf for storing larger items is hidden behind 2 doors with room for your towels and cosmetics. Included is a beautiful black granite top with 8 inch center faucet drillings and a pre-attached white vitreous china undermount sink. This vanity top complements the beauty and function of this versatile vanity ensemble. Also available to purchase are a matching mirror (HZAGM3030). For a bit of traditional style in your bathroom, choose this beautiful vanity. Its beautiful black granite counter and grey solid wood base bring a great new look into your bathroom. Bring a classic look and feel to your bathroom with this beautiful set from Avanity. For some added traditional style in your bathroom, choose this beautiful vanity. Its black granite counter and grey solid wood base are very easy on the eyes. Put together your perfect bathroom with this stylish vanity set from Avanity. For some added traditional style in your bathroom, choose this beautiful vanity. Made with a special grey solid wood base and a black granite counter, this piece will make your bathroom look even nicer. This classic set from Avanity will make your bathroom look brand new. Hazelton 37-inch W Vanity in Antique Grey Finish with Granite Top in Black No matter how small your transitional style bathroom, this 37 inch Hazelton bath vanity will provide character to your bathroom. You will be surprised how much storage this single vanity offers with its four drawers and removable storage cube inserts included in each drawer. A shelf for storing larger items is hidden behind 2 doors with room for your towels and cosmetics. Included is a beautiful black granite top with 8 inch center faucet drillings and a pre-attached white vitreous china undermount sink. This vanity top complements the beauty and function of this versatile vanity ensemble. Also available to purchase are a matching mirror (HZAGM3030). 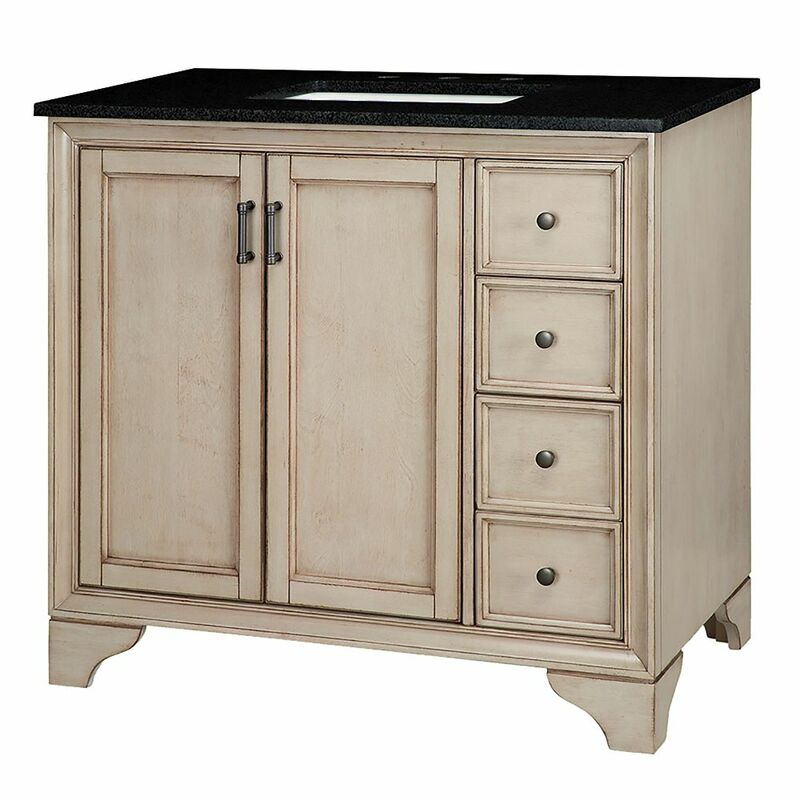 Hazelton 37-inch W Vanity in Antique Grey Finish with Granite Top in Black is rated 5.0 out of 5 by 1. Rated 5 out of 5 by Faye T from Very nice I purchased this vanity at the local store and I'm very pleased with both the appearance & the quality. I'm also pleased to see the selection of matching pieces that are now available for purchase onlin. Why is this product described as a 37&quot; vanity but the specs say the width is 42.5&quot;? What is the actual width? Hello and thank you for your message. Sorry for the delay but we were unable to view your question until now. This is a bathroom vanity with a granite top and sink included. This is sold as a combo until only and you will not be able to purchase one item separately. If you have any further questions please feel free to contact our Customer Service department directly at ForemostCanada@foremostgroups.com.